The hip joint is formed by the articulation of the rounded head of the femur and the cup-like acetabulum of the pelvis. It forms the primary connection between the bones of the lower limb and the axial skeleton of the trunk and pelvis. The surface of the femoral head and the acetabulum, where the bones come in contact, is coated by a smooth tissue called articular cartilage. The cartilage, together with a substance called synovial fluid, prevents the bones from rubbing against each other and from becoming damaged. 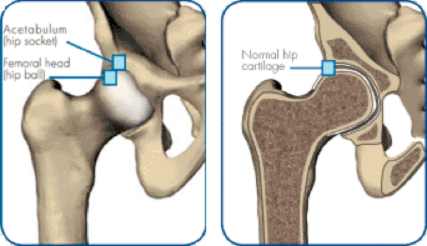 The main cause of hip joint diseases is the wear of the articular cartilage: osteoarthritis. This wear causes pain, initially only when a load is bearing on the joint but over time it becomes painful more and more frequently eventually leading to constant pain even when resting. The increase in intensity of the pain is a slow process, sometimes over many years, and can lead to a stiff hip joint. Hip arthritis typically affects patients over 50 years of age. It is more common in people who are overweight, and weight loss tends to reduce the symptoms associated with hip arthritis. There is also a genetic predisposition of this condition, meaning hip arthritis tends to run in families. Individuals suffering from inflammatory disorders such as Rheumatoid arthritis. Pain when trying to put weight through the leg on the affected side. 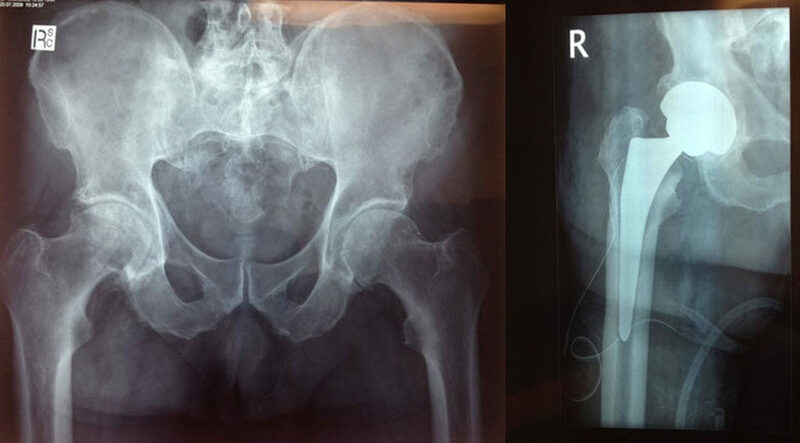 Hip replacement is a common treatment for severe osteoarthritis. 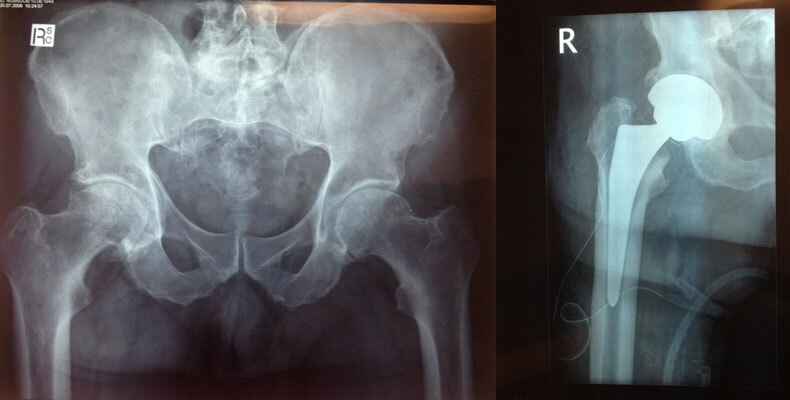 Successful hip replacement brings dramatic pain relief and improvement in the function of the hip joint. The artificial joint is a spherical articulation, composed of a femoral stem with a head (sphere) and a socket cup (hip socket). The stem is made of metal (usually a Titanium or Cobalt Chrome alloy or stainless steel), which guarantees a maximum biocompatibility. The femoral head is made of ceramic or metal. 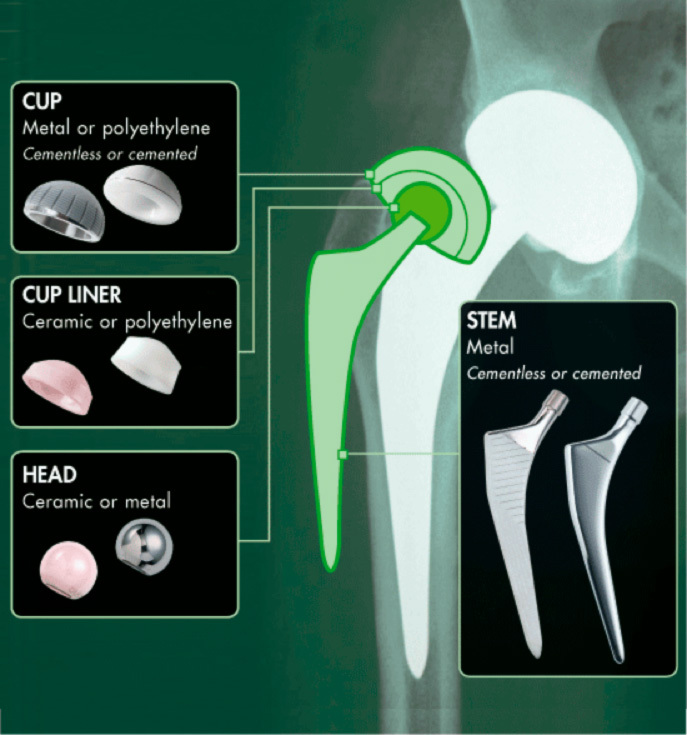 The cup is made of polyethylene or metal with a porous surface (which guarantees perfect bone integration). A cup liner, made of ceramic or polyethylene, assures a long life for the artificial joint, even when loaded under stresses. 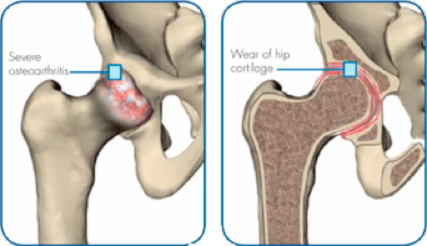 With almost 70 years of history, total hip replacement surgery is a very common and safe procedure for the treatment of severe osteoarthritis. Recovery of mobility: your hip will function with less effort, almost regaining your original mobility. Improvement in quality of life: your everyday activities and your social life will no longer be limited by pain and reduced mobility. Dr Rahme routinely performs the AMIS® (Anterior Minimally Invasive Surgery) approach for all total hip replacement procedures because it reduces the risk of injury to your muscles, tendons, vessles and nerves. This means your recovery following surgery will be much more rapid compared to the other surgical approaches that involve cutting the muscle. True Minimally Invasive Surgery (MIS) is characterized by the preservation of muscles and tendons encountered during the surgery to the hip joint capsule and also offers a reduced skin incision. (meaning your scar will be smaller). The anterior approach AMIS® follows the principles of MIS. Other approaches advertised as minimally invasive (posterior, lateral, or double incision approach) are only reduced skin incision techniques (smaller scar) but are associated with the same muscle and/or tendon injury as “conventional” approaches. The AMIS® or ‘Anterior approach’, in fact, is the only technique which follows inter-muscular and inter-nervous planes to reduce the risk of injury to muscles, tendons, vessels and nerves. It is clearly understandable when looking at the schematics how impingement occurs, the unknown question is why? It is believed that many normal people have ‘bumps’ or slightly over-deep sockets and could potentially develop FAI – this is just the way we are built and develop. But the hip has to also be provoked in some way to cause damage – this explains the tendency for athletes, sporting professionals and active people to be more susceptible to this form of injury. An initial trial of non-operative treatment is advocated for most patients as the pain is relatively self-limiting. Lifestyle modification is the single most important factor. For most this may result in resolution of symptoms but this will restrict attempts to return to sport. Physiotherapy may reduce the local inflammatory reaction, improve core stability, improve soft tissue flexibility and assist in measures to avoid provocation but will not address the underlying mechanical problem. Surgical treatment is performed by arthroscopic and/or by mini open surgical techniques. While the techniques are quite different, the operations both aim to address the mechanical and pathological changes around the neck/acetabulum junction. Both techniques permit examination of the femoral head, neck and acetabulum. The technique can treat labral tears, loose bodies, ligamentum teres lesions, cartilage flaps and impingement lesions and much more. It is possible to excise the impingement bump and excise the ‘pincer’ by acetabular rim recession. The surgery is usually carried out as a day surgery or overnight case, recovery usually takes three months.